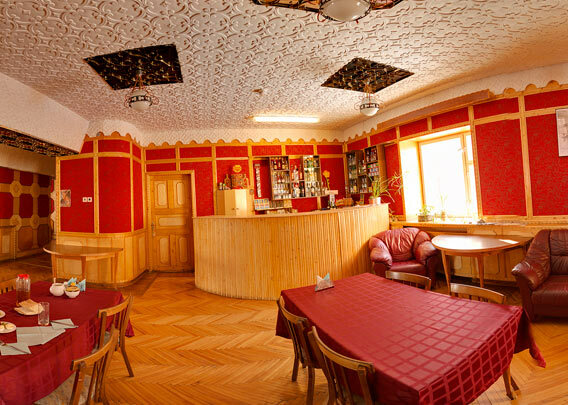 Hotel Tulipan (“Hotel Tulip”) in Pyramiden is located in a former, large residential house that was turned into a hotel in the late 1980s. Back then, the Sovjet Union under Gorbatsjov opened up towards the west and western visitors were suddenly welcome in Barentsburg and Pyramiden beyond occasional arranged visits. 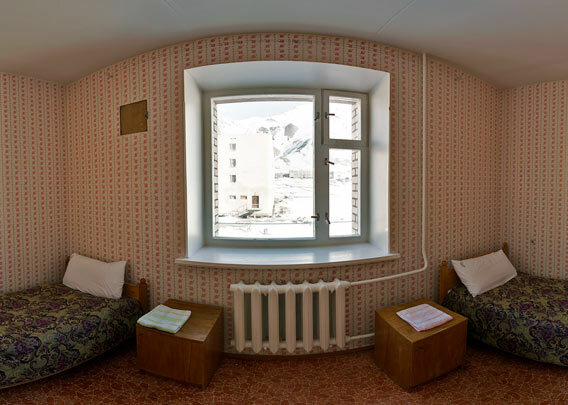 The hotels in Spitsbergen’s Russian settlements were a consequence of this development. Bar and restaurant of Hotel Tulipan, not long after the re-opening of the hotel in spring 2013. Not a bad place to spend some time. Pyramiden’s abandonment in 1998 was later followed by the closure of Hotel Tulipan. For some years, the only accommodation available in Pyramiden was the “Guest house harbour bridge” in shape of some container homes at the harbour. After a period of renovation, Hotel Tulipan was re-opened in 2013. Initially, life there was rather simple – yet not unattractive – but both rooms and food have been upgraded to meet the expectations of modern travellers, at least to some degree. You are not in a big, modern hotel in a big city elsewhere, but well, that’s what you came for, isn’t it? Room in hotel Tulipan. Meanwhile, most rooms have been modernized. More and more visitors, both locals and students from Longyearbyen and international tourists, use the opportunity to spend more time in Pyramiden than just a quick glimpse during a day tour. If you want to book a room in Hotel Tulipan, then contact Grumant Arctic Travel Company.